Award medal of the Lazarian Jemaran of Moscow (Lazarev Institute of Oriental Languages), established in 1815 by the brothers Hovhannes and Hovakim Lazarian. This beautiful medal is one of the true gems of Armenian numismatics. The example shown is gold-washed bronze, 50.5 mm in diameter, 57.01 grams. Exquisitely designed and executed, this piece is a remarkable example of medallic sculpture. It features wonderfully detailed portraits of the two wealthy founders, and a street scene where the school is located. Information on the founders and the school’s history may be found in the 4th volume of the Armenian Soviet Encyclopedia, pp. 469-472 (Yerevan, 1978). 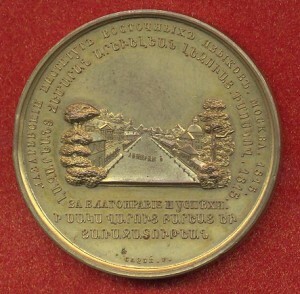 Both sides of this medal were engraved by F. Caque. According to information provided by researcher Henry Sarkissian, the medal was issued in 1854. The building is presently used as the Embassy of the Republic of Armenia in Russia’s capital. EXTREMELY RARE. Gold over copper, 50.5 mm, 57.01 grams. Saryan collection.